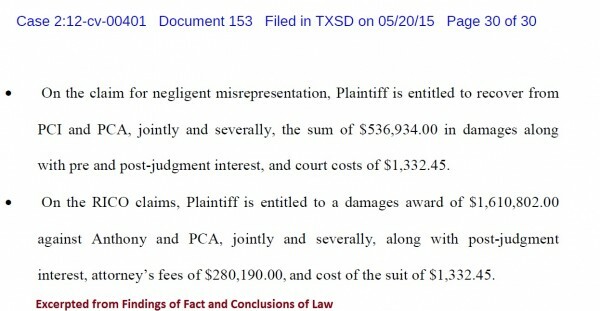 PCA Collectibles, a New York company associated with the former PCI Coin Grading company, was found liable for nearly $1.9 million in damages based on the impression that coins sold to the plaintiffs were graded independently according to industry standards but actually were fake (one coin), damaged or worth only a fraction of Red Book prices. The Red Book, or The Official Red Book: A Guide Book Of United States Coins, was sent by one of the defendants, Anthony J. Delluniversita, to the late Corpus Christi stockbroker Bonnie Peredida, who used it to evaluate the prices she paid against the value for the coins she bought and their grades as listed in the annual book. The case hinged on several issues, including an important one for hobbyists involving Anthony Delluniversita, primary owner of PCA Collectibles. (His son Paul reportedly owned 40% of that company.) Anthony Delluniversita, who had bought PCI, was its sole grader, while coins sold through PCA gave the impression that grades were assigned by an independent entity, PCI. One issue that may be debated by this ruling concerns so-called self-slabbers, who are sole graders, and whether their highly inflated grades in company holders contribute to similar overpayment by buyers. On Internet sites, sellers sometimes cite Red Book or PCGS prices for these coins. If auction portals carry those descriptions, they may want to revisit their terms of service concerning statements of value made by consignors and/or auctioneers and listed through their digital systems. We brought that to our readers’ attention in previous coverage of this case. The case also involved Pereida’s fiancé, Albert P. Malvino, Ph.D., executor of her estate, who had testified that the couple bought the coins for their retirement and believed they had struck a good deal with PCA, again based on those Red Book values. Pereida reportedly made 31 separate purchases of 135 coins and paid a total of $727,569 to PCA for them. However, two entities and one expert numismatist valued the collection much lower. 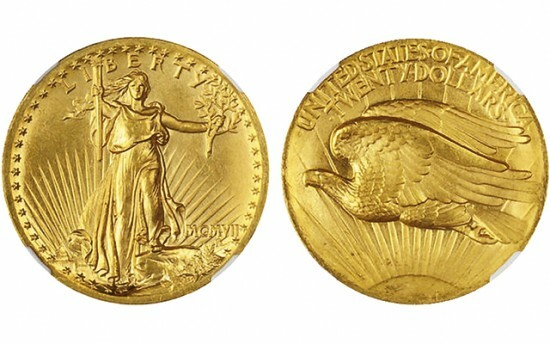 Heritage Auctions Appraisal Services listed it at $190,865 at the time the coins were examined. Paul Montgomery, past president of the Professional Numismatists Guild–retained by Dr. Malvino–put a reasonable retail value of the coins at $150,964, about 20 percent of what Pereida paid. Montgomery also requested Professional Coin Grading Service to do an independent appraisal of the grades. The judge ruled that PCGS’s findings were consistent with those of Montgomery. In particular, Heritage, Montgomery, and PCGS identified one coin as a counterfeit, a 1914-D Indian $2.50 graded by PCI as MS64. According to a news release, they also identified twenty-five other coins that could not be graded because they were either cleaned or damaged. These included a 1907 Saint-Gaudens Roman Numerals High Relief Double Eagle graded by PCI as MS65 and sold for $19,500. Heritage estimated the auction value at $6,000, Montgomery valued the coin at retail as $4,500, and both Heritage and Montgomery agreed with PCGS that the coin had been cleaned. An 1892-CC Liberty Double Eagle, sold by PCA to Pereida for $12,500 and graded by PCI as MS62, was valued by Heritage at $2,600 and only AU. It was valued by Montgomery at $1,700 because it was damaged and also given no grade by PCGS because of a noticeable scratch on the coin. In its final ruling, the court ordered that the estate can recover $1,892,324 from Anthony Delluniversita, majority owner of PCA and the owner of PCI coin grading company at the time the coins were graded and sold to Pereida. Of that total, $1,610,802 is for damages, $280,190 for attorney’s fees and another $1,332 for costs of the lawsuit. You can also read Judge Ramos’s Findings of Fact and Conclusions of Law (PDF) in which she summarizes and then expands on the case. In addition to reevaluating the term “subjective” when it involves industry standards, this case also affirms the necessity for serious hobbyists and investors to know the basics of grading. Coin Update News covers grading extensively in Coingrader Capsule. Another convenient resource is PCGS Photograde Online. Several books also discuss grading and should be a requirement in every hobbyist’s library.